You are currently browsing the Smart Shopping weblog archives for May, 2017. Spring is in the air: so it’s time to update your wardrobe . Raffinalla (Le Groupe Raffinati), the well-known well-made Montreal label is having a Sale at their head office. Save on their Spring/Summer collection including sportswear, coats, belts and scarves. You can also find tops, pants and skirts in their Liquidation Room at $25-$50. Each garment is conceived, cut, sewn, tested and inspected in the brand’s headquarters ­ it doesn’t get more local than that. Check out the timelessness of Raffinalla’s modern luxury collection and you too will be hooked on incorporating their amazing pieces to enhance your wardrobe. There’s no better time to shop for quality apparel at fantastic savings. The Automobile Protection Association has given the thumbs up sign to Andrew Bleakley and his mobile car inspections. Wherever the car is that you are thinking of buying, in a driveway or on a lot, for $120 (plus travel expenses) he comes to you (more if far away) and does a complete inspection, including an ultrasound of the body. You might want to use this service to verify a car before warranty expiration, after a repair job (to make sure it was done properly), before purchasing a used car, before selling (either to reassure potential buyers or to see if it’s worthwhile changing cars), as a pre-trip checkup or just to reassure yourself that it’s free of safety or mechanical problems. He has had great success in court against unscrupulous dealers, especially in cases of rolled back odometers. Real estate agents fret when they hear that Morris Charney is doing the building inspection because they’re afraid that he is too thorough, too qualified. Charney is good at finding defects. He does all kinds of buildings from single-family homesor or condos as well as commercial and industrial buildings. Most inspectors when they find a defect will refer the matter to an expert. Mr. Charney is an expert, a member of two Québec Orders – ­ professional (practicing) architect and city planner. He is a member of IHINA (Independent Home Inspectors of North America) based in Boston ­ and he happens to be a Harvard graduate. Typical pre-purchase inspections run about $1500 + tax for a verbal report or you can buy a written one. Reference is made to current and past building codes. All reports are customized narratives, not computer-generated checklists -­ just the defects, clearly explained. The information provided in both the verbal and written reports are the same. His practice has included renovating many homes, offices and stores so he has a good idea of what things cost. You can check out his LinkedIn site which contains numerous up to date posts regarding typical defects that have been discovered. Most consumers don’t realize that the “new” Civil Code of Québec  deregulated building inspections so that anyone has a right to do them even the purchasers themselves. The only stipulations are that it be done in a “prudent and diligent” manner, “without the need of expert assistance”. Charney believes that a purchaser has the right to be properly informed of what it is they are buying. 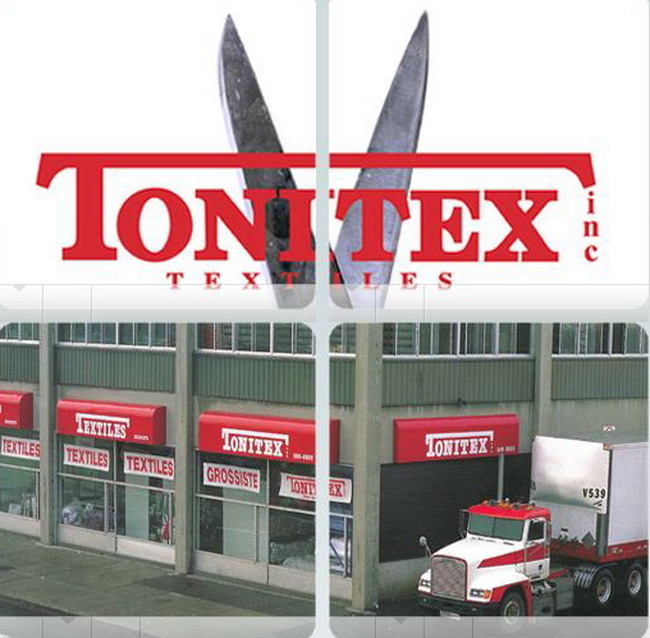 If you are planning some re-decorating, you can find your answers at Tonitex, where the huge space is filled to the ceiling with giant fabric rolls accessed by ladders. Around for 30 years, you will always find a lot of printed cotton sheeting from top brands like Spectrix, Michael Miller, Baum, Andover, Fabri-quilt and many more brands at discount prices. They sell polar fleece, denim, fake fur, plush, cotton prints, nylon, jogging fleece, broadcloth, lycra, flannel, cotton twills and outerwear fabric to the nearby manufacturers and to you too. Look for the coupon bins sold by the kilo – when buying remnants you can save even more money. Coronet Leather Garments is a friendly family business that’s been around for over 30 years. This manufacturer has a showroom of jackets and coats in lambskin, cowhide and some sheepskin for men, women or children. They can do made-to-measure to your specifications and specialize in tall and oversize. They can make suits, pants, skirts, long coats and can do repairs. They also carry Italian lambskin and Spanish shearling. If you have a sports team, jackets can be personalized with logos or emblems. Anyone looking for retro wool jackets with leather sleeves, this is the place for you. 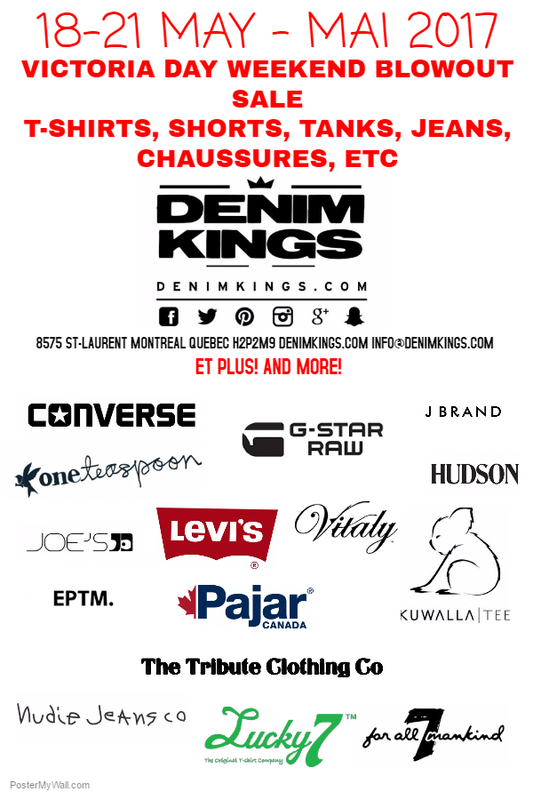 Denim Kings is a retail store which specializes in the hottest men and women’s premium denims and designer clothing, always discounted. Right now they are having a Victoria Day Weekend Blowout Sale on t-shirts, shorts, tanks, jeans, shoes and so much more. So it’s the perfect time to stock up on amazing brand names as Converse, G-Star Raw, J Brand, Pajar, Converse, One Teaspoon, Hudson, Levi’s, Vitaly, Kuwalla Tee, EPTM, Joe’s, Lucky 7, The Tribute Clothing Co, Nudie Jeans Co and 7 for all Mankind. For men size 28-40 and women size 24-31 you will find a vast selection of jeans, shirts, jackets, belts,shoes, hats and jewelry. Whether you’re looking for something trendy or classic, they are well equiped to suit your fashionable needs. If it’s time to re-fresh your floors, Million Carpets and Tiles can offer you whatever you want. Since 1937, this 3rd generation company has been selling carpeting (in any width), rugs (width to 4 meters), wood floors, tiles and floating fiber flooring (great for apartments). Besides making your selection from sample catalogues from every major mill in N. America, you have the option of buying ends-of-rolls and ends-of-lines at great savings. Wall-to-wall carpeting can be special sized to any width, and rugs can be made up to 4 metres. Other locations: Laval, 175 Blvd. de la Concorde East (450-663-9870); Ville St-Pierre, 170 St. Jacques St. (514-365-1652). Friendly Helpful Radio St-Hubert for TV’s and Sound Systems – and Service! Head right for Radio St-Hubert as they are the center for Bluetooth compatible equipment – speakers, music systems, re-chargeable speakers, headphones, etc. Top of the list is Sonos which is a smart system of HiFi wireless speakers and audio components. One app unites your digital music collection which you can then control from any device. Music comes to life with crystal-clear fidelity with zero dropouts. You can buy Canadian by ordering Bryston amplifiers and speakers made right here in Peterborough, ON. Not only are you supporting our country’s workers but they are guaranteed 20 years. Buying electronic equipment these days is so confusing. So why not go to a friendly small business where the salespeople are there to answer informatively any questions you may have. 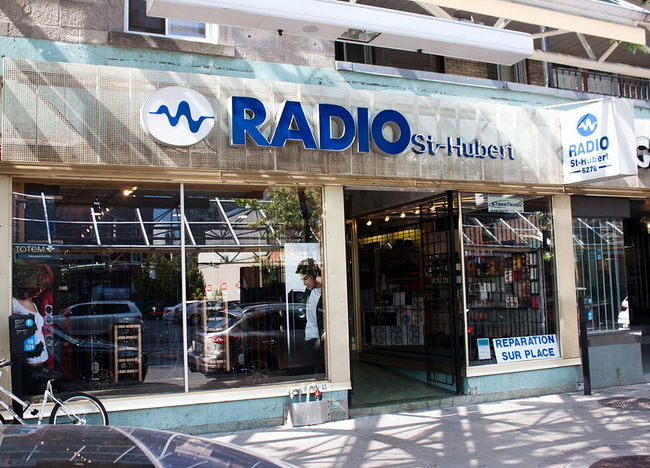 Radio St-Hubert is a family business which for over 50 years is still going strong, despite the big box stores that have opened. This audio, TV, video business has survived with old-fashioned, patient good customer service and sales people who have been there a long time. For speakers you can buy Paradigm, Klipsch, Monitor Audio, Epos, Totem, Dynaudio, as well as sound equipment by Sonos, Pioneer Elite, Cambridge Audio, Anthem, Creek, Yamaha, Cyrus, Sunfire and Sugden. For TV’s it’s Samsung and Panasonic. Look for Tivioli radios and Illico digital boxes. Installation can be provided, and there’s a friendly in-house service department. Posted in Household | Comments Off on Friendly Helpful Radio St-Hubert for TV’s and Sound Systems – and Service! If you drive down this industrial street, you will find a sparkling treasure trove tucked away in a nondescript building and up a flight of stairs. With bridal showers and wedding season starting up, this is the place to head to get more bang for your buck. The glitter of crystal (Badash, Waterford) like Swarovski (even jewelry), china (Lenox, Kate Spade, Royal Doulton, Minton, Herend, Royal Crown Derby, Noritake, Vera Wang, Villeroy & Boch, Wedgewood, Monique Lhuillier) and figurines await you. Look for giftware and serving pieces by Herend, Beatriz Ball, Michael Aran (cocktail accessories too), Momo Panache‘s brightly colored serving pieces and Julia Knight‘s cake plates, colored glassware and vases. The showroom is chock full of merchandise, and the prices are right. 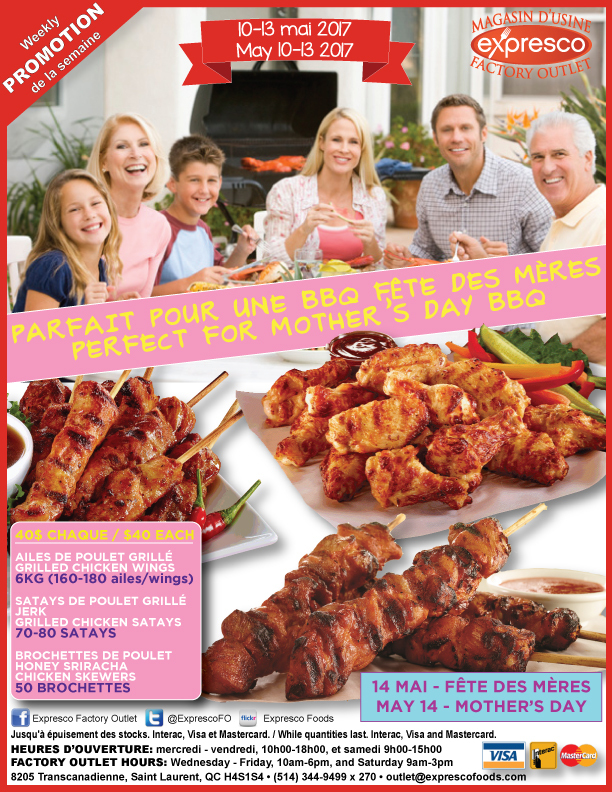 Thinking about making a Mother’s Day Barbecue, well look no further because Expresco has you covered. Choose from 6kg chicken wings, 70-80 grilled chicken satays, or 50 chicken skewers for only $40 each. With these low prices it’s the perfect time to gather the family around. Expresco specializes in creating top quality, easy to cook skewers and also sell a variety of frozen cooked foods. Shopping at a food wholesale outlet means you get great pricing. Open since 1987, Expresco Foods is the leading manufacturer of meat-on-a-stick and their state-of-the-art facility ensures the strictest health standards are enforced. This is the place to stock up when you are having a crowd for dinner, or just want an easy meal at the end of a long day or might be having last minute guests. They can sell to you at wholesale prices for these large quantities. No cash payments.